A hydrogen peroxide mixture is a useful solution for anyone growing tomato plants. This easily prepared mixture can be administered to tomato plants either by pouring it directly on the soil as the plants would normally be watered or by using the mixture as a spray. The method of application you choose depends on the reasons for applying the mixture. A hydrogen peroxide mixture can have positive effects on tomato plants. The hydrogen peroxide sold in most stores is a 3 percent concentration of hydrogen peroxide with the rest of the solution being water. Higher concentrations are sold mainly at specialty stores, but check the label before purchase to be certain it is a 3 percent concentration. This is the strength you want for the mixture. Note that the name on the label isn't always the same; sometimes it is referred to as a topical solution. A quick label check will reveal that they are in fact the same product. Making the mixture requires diluting hydrogen peroxide with water. When preparing a mixture for misting plants to prevent infection or mildew, add 1 1/2 tsp. of hydrogen peroxide to 1 cup of water. When you apply it to many tomato plants and need a larger quantity of mixture, add 1/2 cup of hydrogen peroxide to each gallon of water. To remove fungus from plants or their soil, make up a stronger solution by doubling the amount of peroxide per mixture but keeping the same amount of water. If the soil needs to be aerated or has mold, fungus, or bacteria growing in it, apply the mixture directly to the soil the same way you normally water plants. The hydrogen peroxide mixture controls unwanted growths in the soil by oxidizing them on contact, killing them with no harmful side effects. Because the mixture quickly breaks down after application, it will release water and oxygen into the soil, aerating it easily and efficiently. When fungus or mold are growing on a tomato plant, use a spray bottle to spray the mixture directly onto the plant itself. This kills the unwanted organisms on contact, whereas the absorption of the mixture through the roots does not affect them. This also helps to fight off and prevent bacterial infections in tomato plants. 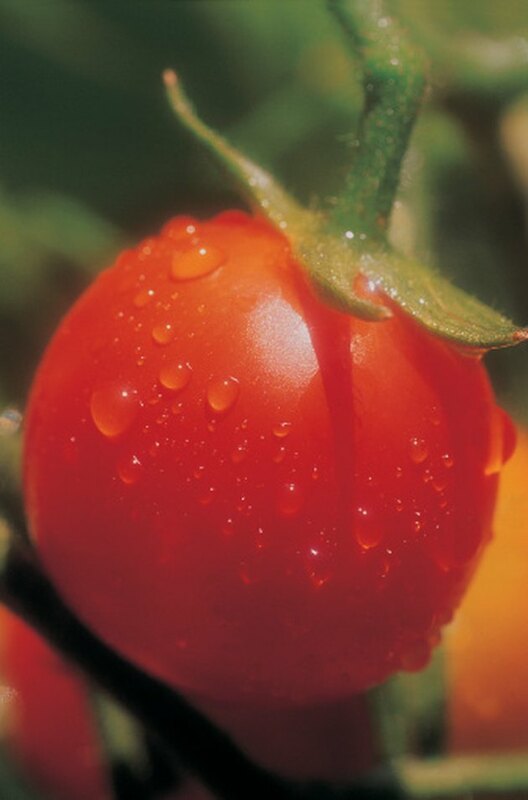 When working with an entire greenhouse of tomato plants, spraying the mixture generally throughout the air can prevent mildew in the moist conditions.